The Princess Royal Maternity Hospital stands next to the Glasgow Royal Infirmary on Alexandra Parade in Glasgow. It is equipped with 140 beds and offers pre- and post-natal maternity care and also has a special neonatal unit which provides special baby care and intensive care facilities for newborns. The Princess Royal Maternity opened in 2001 as part of the Royal Infirmary complex. It has a full range of antenatal services, such as ultrasound and pregnancy assessment. It has daycare facilities catering for women who are experiencing high-risk pregnancies and a 24-hour service for expectant mothers who have booked to give birth at the Princess Royal Maternity and who may have questions or concerns about their health and the progress of their pregnancy. For anybody looking for hotels near Princess Royal Maternity, The Sandyford Hotel on Sauchiehall Street between the West End and Glasgow city centre is an excellent choice. Our rooms are both comfortable and affordable and we provide B&B accommodation with full Scottish breakfast to all our visitors. The en suite rooms are fully-equipped with television, tea and coffee-making facilities and a free 24-hour Wi-Fi connection. At The Sandyford Hotel quality comes at a cheap price. To make a booking to stay at The Sandyford, simply call our reception staff who will be delighted to answer any questions you may have about bed and breakfast accommodation near the Princess Royal Maternity Hospital. The reception is open 24 hours a day and you can also make a reservation with the help of the online booking form on this website. 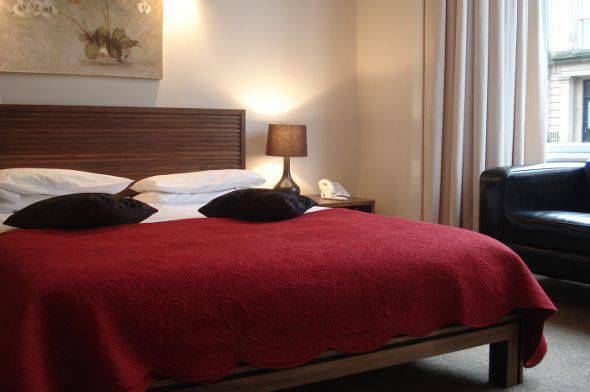 Call The Sandyford Hotel in central Glasgow today for quality accommodation at affordable prices.